weighing plate and protection against wind. - Taring function in the entire range (multiple taring is possible). - Removable stainless steel weighing plate. - ISO Certificate is available for the accurate scale (ex: DIN ISO 9000). 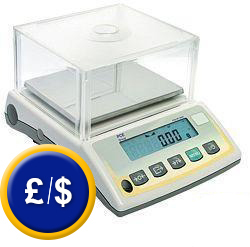 1 x Accurate scale PCE-BT (depending on the model), 1 x weighing plate, 1 x mains component, 1 x protection against wind and user manual. Software is in German and includes RS-232 cable. The software allows the transmission of the weighing data to a computer. Data can also be exported to other software such as MS Excel. If your computer is a portable or it has only USB ports, the adaptor have to be used. In case your PC or Portable uses USB-Interfaces, you can use the adapter together with the standard RS - 232 - Cable. Software (covering the actual drivers) is included. The printer is used for direct output of weighing data. It will be delivered including RS-232-cable, USB-cable, net adapter and 1 paper roll. For companies that wish to include this accurate scale in their set of internal testing tools or for annual recalibrations. 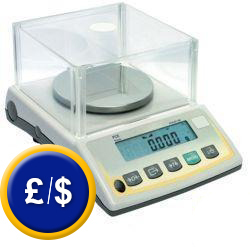 The ISO certificate includes a laboratory calibration and a control document with all the measuring values. Customer's name and details are included. For occasional accuracy controls/or for recalibration of accurate scale in situ/in the company. A certificate for control weights can also be issued to certify the compliance with the International control standards. Here you will find an overview of all the measuring instruments available in the offer of PCE Instruments.